.... There's Hope. Hi, I am back with a new post for Challenges 4 Everybody and found a beautiful image at Bugaboo's Store. It's sort of an easy and simple card, but I do love the message it sends. I hope you like it too!! Your turn to have a look! 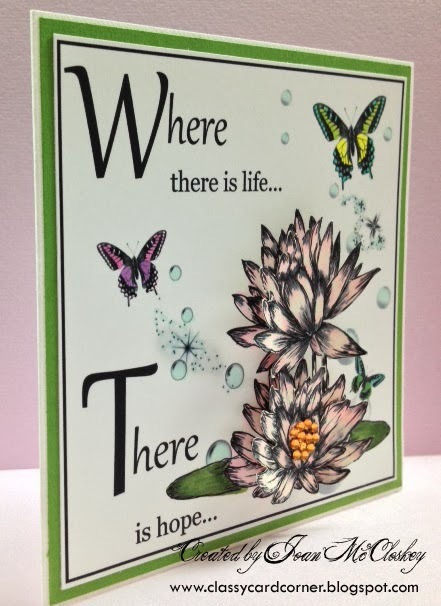 I posted two different positions of the card to show that it was 3D as the flowers were cut out and adhered on top of the printed image. Just for a nice "pop"! I used card stock from my stash and colored the images with my Copic Markers. Just a very soft coloring I thought would be nice. I glued some dark yellow rhinestones in the center of the opened Lily and that is it! 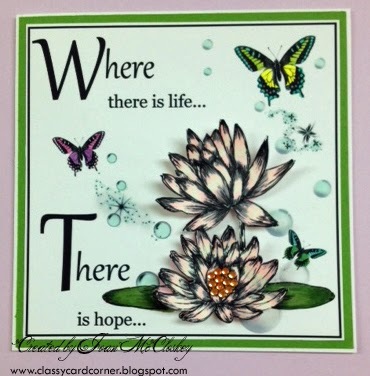 I hope you like it, I thought it was a very nice image with sentiments that I chose from our Very Generous Sponsor, Bugaboo Stamps. Now it's your turn to get your card posted for our "Anything Goes Challenge" at Challenges 4 Everybody and you be the next winner!! Thanks for coming back to visit and if you're new to my blog, please feel free to look around, there are lots of cards that have been posted for all occasions. Enjoy and I hope you enjoy your visit and come back soon. Y'all are like family!! !